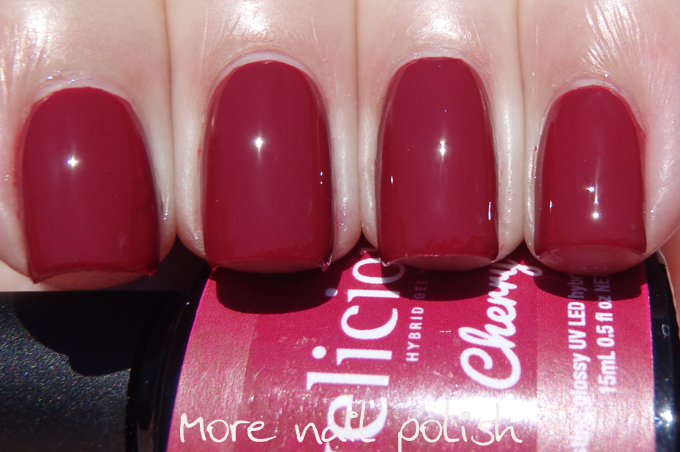 Australian Hybrid Gel brand Gelicious released a new collection of colours today called the Berry-licious collection. The colours are just gorgeous and I thought I would share my swatches here tonight mainly because I want there to be some 'real' swatches of these pretty shades available. You see I provided swatches to Gelicious of these colours, like I have for more than 70 gel colours (and let me tell you, swatching gel polishes aint easy). Unfortunately this time, they must have felt my swatches weren't up to scratch, as they have undertaken some rather heavy photo shopping of the images that appear on their site. Their edited photos don't accurately represent what these polishes will look like on a real persons hands, and I know I want to see real fingers, before I buy a polish - so figured you would too. In providing the images to Gelicious, I provide them at full resolution and let them edit the photos as they see fit. I know my polishing skills aren't perfect, and as a full time working busy woman with two young children, my hands and nails get quite a work out. That is why I expected them to touch up my cuticle blemishes, smooth out obvious bumps and the like to make the photos 'production' worthy. In the past, with the other 60 odd shades, this is exactly what they have done, and I think the swatch photos on their site looked really great, and realistic. I also know a lot of Australian polish lovers recognise my nails (I know when I see nail photos of bloggers I immediately know who's nails they are) and I don't want my readers thinking that I provided or endorsed those photo shopped images. Anyway, here are my 'real' swatches, with bumpy edges and patchy spots. This is what the polishes really look like! Cherry - a deep blood red crimson. This is two coats with Gelicious top coat. Cranberry - a rich dark pink, or maybe it's more a pink toned red. Two coats with top coat. Luscious and juicy. 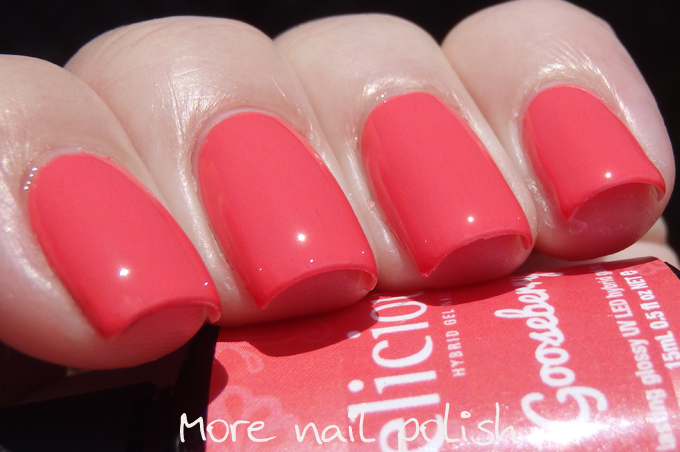 Gooseberry - a gorgeous coral, probably my favourite in the collection. Two coats with Top coat. You know I don't think I've ever actually eaten a gooseberry! Grape - a dark purple jelly. This one needs three thin coats to ensure you don't see any patches when taking full sun photos, but for regular day wear this would be fine at two coats. This is three coats with top coat. 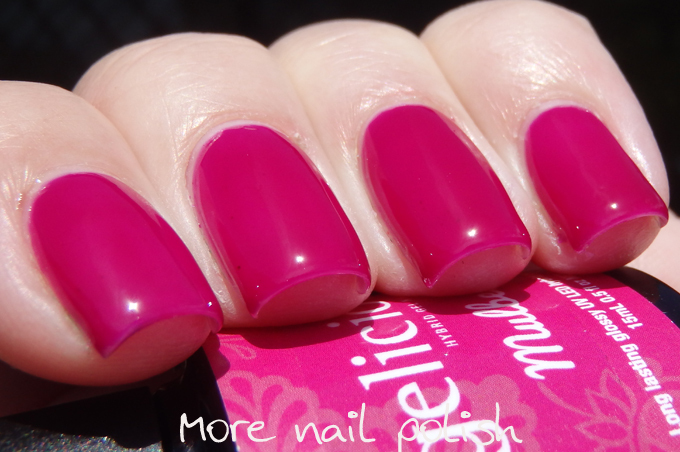 Mulberry - a bright and pigmented hot pink. Umm I love Mulberry's and our Mulberry bush (or should I say tree) is in full fruit at the moment. I eat some everyday! Two coats with top coat. Raspberry - a medium candy pink. Strawberry - with pips. I really love this one. It's the bright pink sister polish to Little Prince George. Medium toned hot pink with white hex glitters. This accurately shows how much glitter you are likely to get on your nail, unfortunately the photo shopped swatches on the Gelicious site have extra white glitters added to the nails making it appear more even coverage. It should also be noted that the labels on my bottles here are not the real bottles and do not represent the real label colours (although I have not seen the actual bottles in real life, but the bottles on the Gelicious website have different coloured labels to these). I really do love these gel colours, they are rich and bright and look fantastic on. I just wish Gelicious didn't feel the need to show these polishes in a 'perfect' and unrealistic way. What do you guys think of my swatches - are they a bit sloppy or ok for the site as they are? 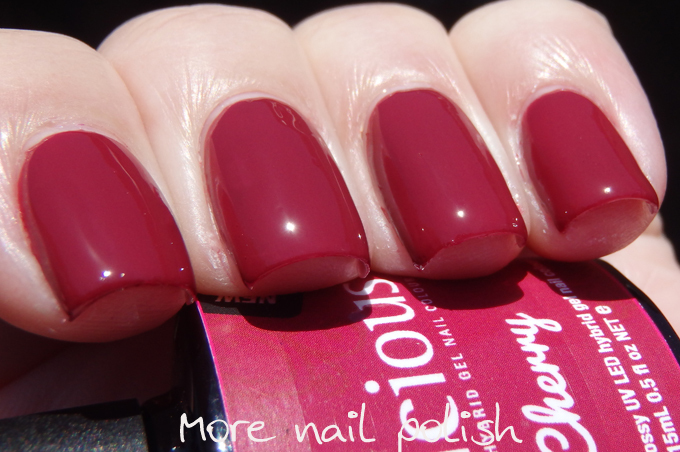 You can purchase the Berry-licious collection polishes via the Gelicious Website (where you can also view the photo shopped images). Beautiful REAL swatches! Thank you :) I was kinda weirded out when I saw them on the gelicious website. I don't trust polish if the company feels the need to photoshop swatches so heavily. Makes me think their product isn't good enough to show without faking it. I just had a look on my tablet and I found the photos unrealistic and bit freaky. I just wouldn't buy from a site with fake looking photos like that. As for adding more glitter that's just not right. And yes whenever I see your nails I recognize them. I would feel justifiably upset if they were my swatches. I think your swatches are pretty good for that sort of website, a lot of other websites have loved them. I adore your real swatches. I'm so disappointed that they edited these amazing swatches. I much prefer real pictures, not blatantly edited ones. When I see overtly Photoshopped stuff, I automatically worry there's something wrong with the product. Hmmmm, they played with the colours amd cuticles a little too much. I like your non shopped pictures better and I don't see the issue with them. There is nothing wrong with your photos at all! I don't see why they would change them, I'd much rather see real life photos than those that look like a plastic doll! Why do you say Gelicious is a hybrid though? Your swatches are the reason I bought Gooseberry. It's exactly the way the colour looks. 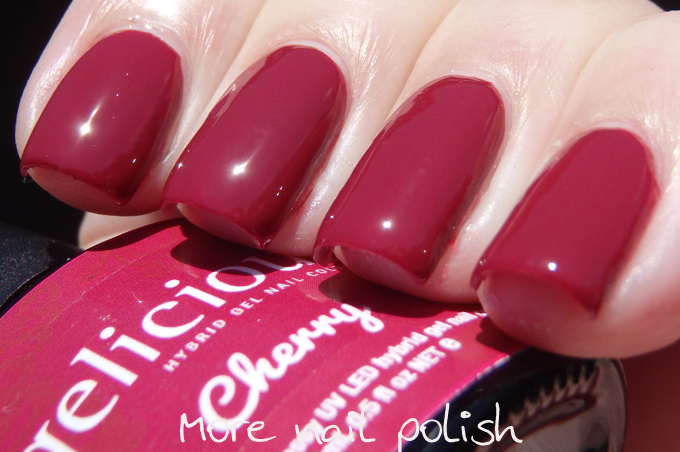 Had I relied on the Gelicious website swatches, this would not have been my pick. 1/ Can you please direct me to your other swatches for this brand? 2/ Do you have any idea what a good match to this might be in opi? I'm not limber enough to do my own pedi anf I don't really want gels on my toes. I've just discovered your blog. Great! Can you please point me in the right direction to find your other swatches for gelicious colours? I'm new to the land of blog. Can you also advise if you know of a good match to Goosberry in opi? I'm not limber enough to do my own pedis and I don't want gels on my toes.